Phase one of an Air Force research program, the largest Youngstown State University has ever worked on, has wrapped-up. The $8 million first phase of the Maturation of Advanced Manufacturing for Low-cost Sustainment program allowed for YSU undergraduate and graduate engineering students to research how to improve spare parts for aging Air Force aircraft with advanced manufacturing technology such as additive manufacturing or 3-D printing. One of the parts YSU students worked on was a T-pipe header, which is a part of the aerial spray system on aircraft flown by the 910th Airlift Wing in Vienna Township. After a digital model of the pipe was created, a molding was created through additive manufacturing so the part could be replaced quicker than usual. “They were running into procurement issues where it would take weeks or months to get these components. We came up with a better solution,” said Dave Siddle, senior program manager National Center for Defense Manufacturing and Machining, the managing company of America Makes, an additive manufacturing hub located in downtown Youngstown. To wrap up phase one of the program, YSU and America Makes had a two-day event starting Wednesday that brought in representatives from some of the world’s leading companies in additive manufacturing including Lockheed Martin, Raytheon and Boeing. The program, which started two years ago, was driven by the NCDMM. Partners on the project included more than 25 manufacturing companies, universities and research organizations, including Air Force bases. Through the program, some students learned the research process and how to apply the research. Other students were able to work directly with members of the Air Force and manufacturers that they otherwise wouldn’t have worked with, said Brett Conner, YSU associate professor of Manufacturing Engineering and director of the Advanced Manufacturing Research Center on campus. 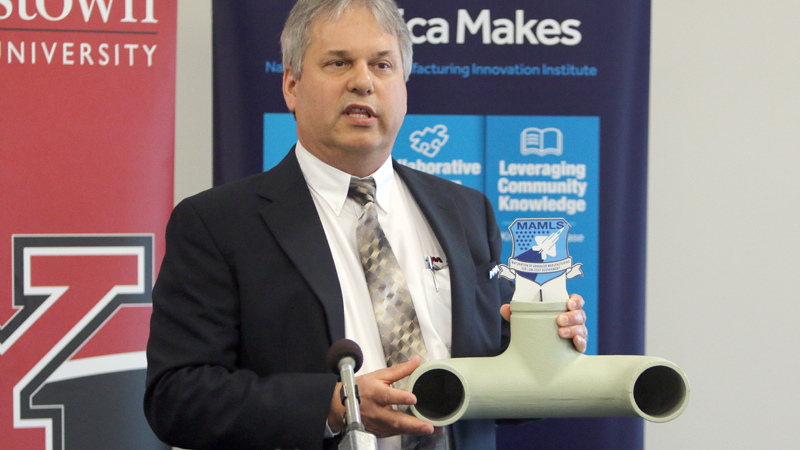 America Makes’ presence here forced YSU to step up its game with additive manufacturing. “I think it was a real catalyst for us,” Conner said. Phase two of the three-phase $27-million program is underway. In this phase, critical, complex parts will be researched. March 28, 2018 11:50 a.m.
March 28, 2018 10:55 p.m.
September 28, 2016 12:02 a.m.